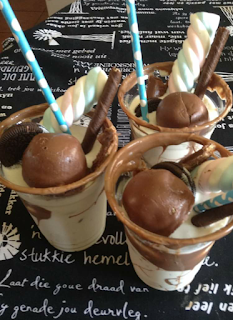 The kids (and their mum) have been dying to try gourmet milkshakes but it seems like a lot of the places here in P-town are still closed so we decided to make our own crazy milkshakes. It was loads of fun. We added everyhing chocolate we could lay our hands on and topped it off with mint sweetie pies. Happy memories are made when there is a ton of chocolate involved. Why o why does time seem to fly when you are having fun? Oh I also want some!